Top row (left to right): 1. Roger Cecil, 2. Heather Kavanagh, 3. Wally West, 4. unidentified, 5. Martin Kelly, 6. unidentified, 7. Kurt or Karl Peters, 8. Alexis Horton, 9. ?Tracy Rose. Second row: 1. Tom Schall, 2. Debbie ?, 3. Mark ?, 4. unidentified, 5. ?Ricky ?, 6. unidentified, 7. Paul Hudson, 8. unidentified, 9. Jason Sexton. Third row: 1. David Miller, 2. Laura Trimble, 3. Dan Griffin, 4. unidentified, 5. Nathan Duerre, 6. Carol McClelland, 7. Stuart Meadows, 8. unidentified, 9. ?Jeff Gregory. Fourth row: 1. no picture, 2. Mrs Badger, 3. unidentified, 4. unidentified, 5. unidentified, 6. Barbara Miller, 7. John Flemming, 8. Mr Larsen, 9. no picture. Credits: From the collection of Roger Cecil. Thanks also to Ron Simmons for submitting a scan of this picture. Thanks to Roger Cecil, Shelly (Griffin) Hughes, and Tom & Marilyn Miller for identifying the kids in this picture. 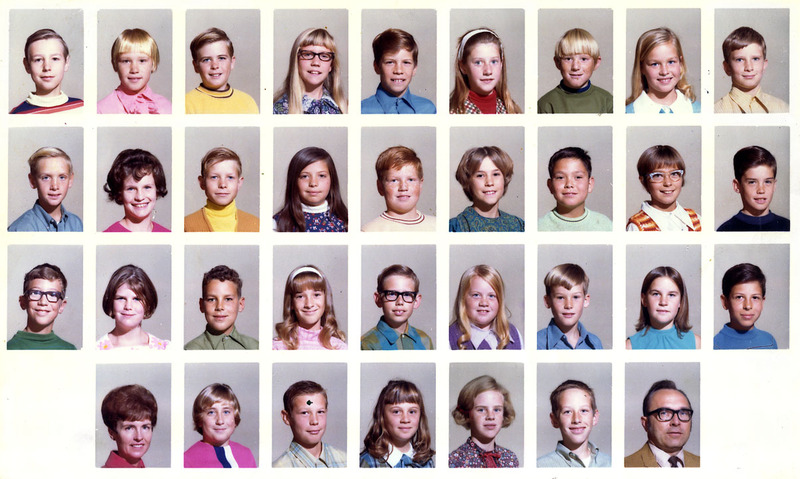 The kids in the picture are members of the high school graduation class of 1978. To find other pictures of the class of 1978 in the archive, see Livermore class pictures listed by year of high school graduation: 1978. And if you have any pictures of the class of 1978 that you would like to share, please submit them to the Archive.